The Work Sharp Guided Sharpening System is a complete sharpening solution for every knife you own. It features the innovative Pivot-Response System which allows the abrasive to follow the curve of the blade – making manual sharpening faster, easier and more precise than ever. With all of the bushcraft and survival blades that I test and review, there is no doubt that I need to keep a good sharpening solution close at hand. From stones and strops to field sharpeners, I have certainly tried a lot of them. Stones and strops require a lot of patience and skill, and field sharpeners just cannot do the job alone. Besides, I’ve seen the damage that draw-style sharpeners can do to a blade. Today, I’ll be looking at the Work Sharp Guided Sharpening System (WSGSS) and the WSSA0003300 Upgrade Kit to see if meets my needs. Once I received my Guided Sharpening System from Work Sharp, I quickly opened the box to find the basic kit packed neatly inside. I pulled out the Benchtop Sharpening Platform, the core element of the entire system, and began my inspection. Each end consists of a rugged plastic foundation with solid textured rubber feet, various steel pins and magnetic locks built in. There are two 1/2″ steel rods running in parallel connecting the two ends together approximately 1.25″ apart. On top of each end, there are reversible blade angle guides that are held firmly in place with a small tab and magnet. 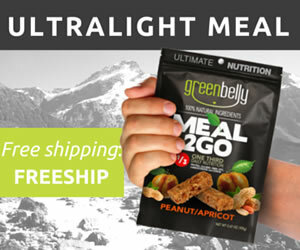 Each can easily be set at 17° or 20° depending on your needs. The 17° guides are commonly used for kitchen cutlery and the 20° guides are most often used for bushcraft and survival blades. The key feature of the WSGSS platform is the innovative Pivot-Response System. It consists of an abrasive plate cradle that magnetically holds the sharpening plates in place and a locking mechanism tucked away between the bottom of the cradle and the two steel frame rods. When the slide-lock has been activated, the cradle is locked firmly in place. Perfect for sharpening straight blades. When the slide-lock has been deactivated, the cradle will then rock side to side as the blade nears the edge of the abrasive plate allowing the abrasive plates to follow curved blade patterns. Additionally, this allows the abrasive plate cradle to be removed. The kit also comes with a Ceramic Field Hone with fixed angle guides that can not only be used freely in hand, it will also snap into the WSGG base in place of the abrasive cradle for a solid working platform. The Ceramic Field Hone has a three-position ceramic rod (coarse, fine, fish hook groove), and two smaller diameter ceramic rods for sharpening serrated blades. Two abrasive diamond plates are provided with the kit; the Coarse Grit Diamond Plate (320 Grit), and the Fine Grit Diamond Plate (600 Grit). When these two plates are used in combination with the Ceramic Field Hone, the WSGSS is capable of handling most of your sharpening tasks. The WSGSS comes with a comprehensive User Guide/Quick Start Guide that details most common sharpening tasks and the recommended solution. 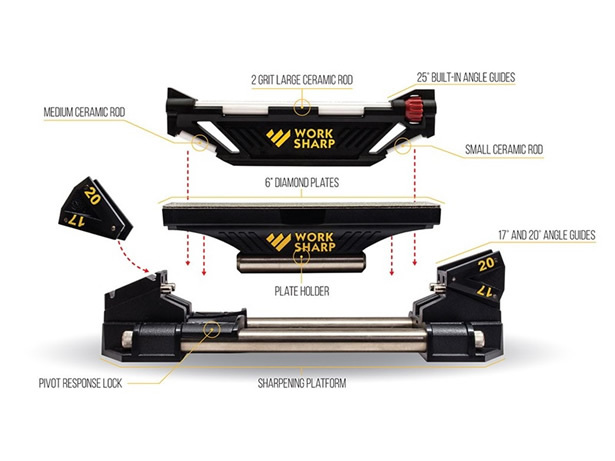 Lastly, the Work Sharp Guided Sharpening System comes with an astounding 42 year warranty. Why 42 years? Well… Work Sharp says, “that’s how long we’ve been serving our customers, and we’re looking forward to another 42. We love what we do, we take it seriously, and we’re in this for the long haul”. Of course, the warranty only applies to non-consumable parts which includes everything except for the abrasive elements of the kit (diamond plates and ceramic rods). 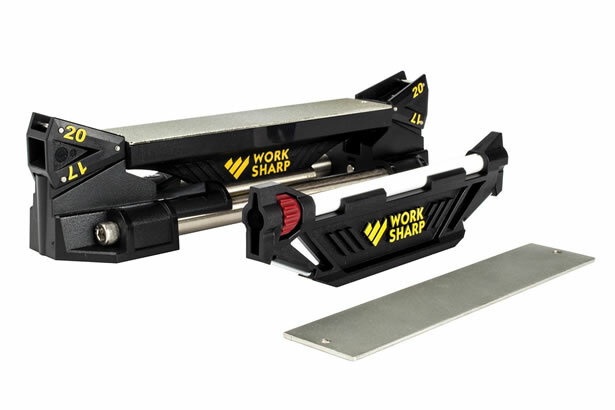 There is an upgrade kit available for the WSGSS that extends the functionality of the sharpening system by adding two additional abrasive diamond plates; the Extra-Coarse Grit Diamond Plate (220 Grit), and the Extra-Fine Grit Diamond Plate (800 Grit). The Extra-Coarse plate can be used for repairing damaged blades and sharpening a wider range of tools where the Extra-Fine plate is used for delicate sharpening tasks and edge refinement. The upgrade kit also includes a Leather Stopping plate with a pair of 25° stropping angle guides and a small amount of white petroleum jelly and 0.5 micron chromium oxide honing compound to get started with using the strop. Since Work Sharp has done such a fine job with their documentation and demonstration video, I figure I won’t go into the how too much. However, I will cover sharpening a few fixed blades and folders in addition to mentioning any tips that I learn along the way. 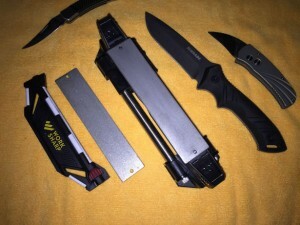 The fist blade that I am going to attempt is a cheap Tiawaneese 2.5″ folder. I chose this one to be my first with this system as I figure out what the heck I’m doing. 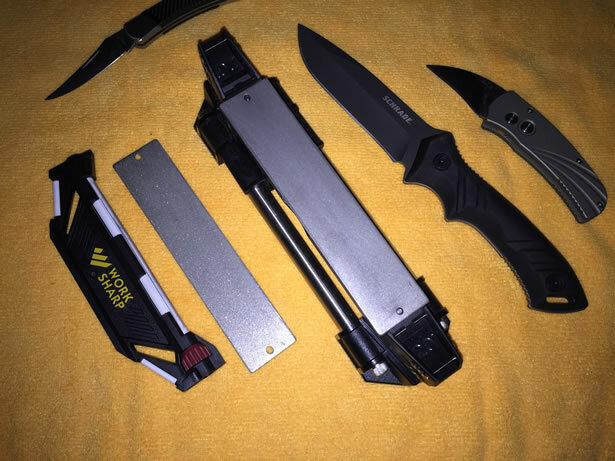 I pulled out the guide and looked up the knife… A drop-point folder. Based on the flowchart in the guide, it recommends leaving the pivot response unlocked. The next fork on the chart questions whether or not you have the upgrade kit. However, for this demonstration I was not going to utilize the extra abrasive plates and strop to simplify the process a little by limiting the number of steps required for each blade. The formula based on the final element on the flowchart recommended using the 20° angle guides and starting with the coarse abrasive plate first. With the coarse plate in place, the guide recommended using as many strokes as necessary until a burr was created along the entire edge of the blade, at which point you flip the blade over and change direction to create a burr along the other side. Key tip… Do not let the tip of the knife drop off the edge of the diamond plates as you make each pass. This will prevent the tip from unnecessarily chipping. The next step required swapping out the coarse plate with the fine plate before completing 15 strokes on each side, and more if necessary. Once the blade’s edge was at the point where it was ready to hone, it was then time to pull out the pivoting cradle and replace it with the ceramic hone to finish off the blade’s edge. With the ceramic hone in place and rotated to the coarse side, the formula recommended a total of 30 strokes, alternating one stroke on each side of the blade before rotating the ceramic hone to the fine side with 30 more strokes, alternating one stroke on each side of the blade until complete. After all that, a knife that would only cut butter on a warm summer day could slice through a single sheet of printer paper with ease. Though I am sure I could have gotten it much sharper had I used the Extra Fine abrasive plate and the leather strop. I performed the exact same process on a larger fixed blade reaching a similar result. Next time I’ll surely take it a step further. Finally, I tried sharpening a recurved folder using the exact process as recommended by the guide. For recurved blades, the guide recommended skipping all of the work with the diamond plates and using the ceramic hone only, just as before. With the ceramic hone in place and rotated to the coarse side, the formula recommended a total of 30 strokes, alternating one stroke on each side of the blade. Of course the blade I was sharpening required a whole lot more than that. By the time I was finished with the coarse hone, I must have performed at least 60 strokes on each side before it was ready to rotate to the fine side. However, once I had the edge to the point where it was ready for the fine hone, it only required 30 strokes, alternating one stroke on each side to finish off the blade. After playing around with Work Sharp’s Guided Sharpening System for a few weeks, I found it to be a real winner. It is a complete knife and tool sharpening system with features and functionality that are both versatile and well thought out. For me, mobility and not having to rely on a power source are really big pluses. 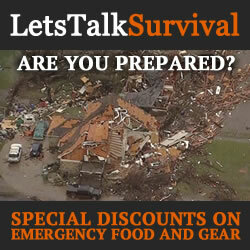 Whether you are an expert or a novice, the WSGSS makes the job of maintaining your cutlery simple and as painless as possible… Almost to the point of being failure-proof, as long as you actually follow the recommendations provided in the guide and the tips found in the demonstration video. If not, it is not much better than any other solution. I wholeheartedly recommend watching the video and giving one a try for yourself. Darex brands include Darex® industrial bit sharpeners, Drill Doctor® professional and DIY drill bit sharpeners, and Work Sharp® knife and tool sharpeners. Darex began in 1973 in Beecher, Illinois. The D, A and R of DAREX are the initials of three generations of the Bernard family; David, Arthur and Richard Bernard. David and his father Richard founded Darex. Grandfather Arthur Bernard, who earlier founded the Bernard Welding Company, contributed his energy and guidance to Darex. In 1978, Darex relocated to Ashland, Oregon where they are located today. In 2008, Matthew Bernard became the fourth generation family owner of the company. Since its beginning, Darex has grown to become the makers of the world’s best-selling industrial drill sharpeners as well as full range of commercial and consumer sharpening products. Darex has been helping industry professionals and do-it-yourselfers stay sharp for over 40 years.